Above: A New Way® Sidewinder ZXT strikes a pose. Las Vegas, NV - The fastest-growing manufacturer in the US waste industry has extended it's reach by unveiling a new product line that's got some extra "bite" on the side. Many in the industry had been waiting for New Way®'s announcement at the 2009 Waste Expo after mysterious ads hinted at the new models. What the company unveiled at the Expo were the Sidewinder ZXT and Sidewinder XTR- a pair of all-new automated side-loader trucks. The models have an exclusively designed trash-gripping hydraulic arm that is the strongest in the industry. The Sidewinder fits perfectly into New Way®'s lineup of other snake-monikered units (such as the Viper, Diamondback, Mamba, Cobra and King Cobra), but is unique because of its side-loading capabilities. The centerpiece of both the ZXT and XTR models is the unique arm design (the ZXT lifts as much as 500 lbs. and spans 6 feet; the XTR hoists 750 lbs.). Both models are equipped with the same New Way® exclusive gripper at the end of the arm, which is centered in-line for increased durability. The main difference between the two models is their size and payload capacities. The ZXT is lighter but still packs many features onto its maneuverable chassis, including some which help the snake squeeze impressive capacities into its compact hopper. The XTR offers body capacities of 20-31 cubic yards. Both trucks sport a smooth body design that's stronger and more attractive than conventional trucks. The smooth surfaces also make it easier for waste collection companies to show off their logos on the side. 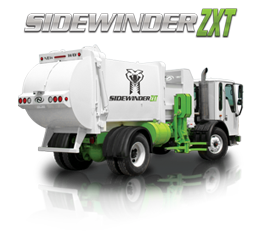 Because the Sidewinder can be operated by a single driver, both models bring the New Way® difference to anyone looking for an increase in their crew's efficiency. The loyal New Way® fans will certainly be among them.